A star-studded ceremony was capped by the big event: the lighting of the massive Christmas tree in New York's Rockefeller Plaza. The most famous Christmas tree in the world was set a-sparkle in a star-studded ceremony full of holiday cheer in New York's Rockefeller Plaza Wednesday. The much-heralded lighting of the 76-foot-tall Rockefeller tree, with its 45,000 twinkling lights, signals the official start to the holiday season. Matt Lauer, Al Roker, Savannah Guthrie and Natalie Morales co-hosted "Christmas in Rockefeller Center," which culminated with the dramatic lighting of the tree just before 9 p.m. ET. The most famous Christmas tree in the world is set to be adorned with lights in a star-studded ceremony in Rockefeller Plaza Wednesday. Gus Rosendale reports. The star of the evening, though, was the tree, and at 8:55 p.m., the switch was thrown to light it. 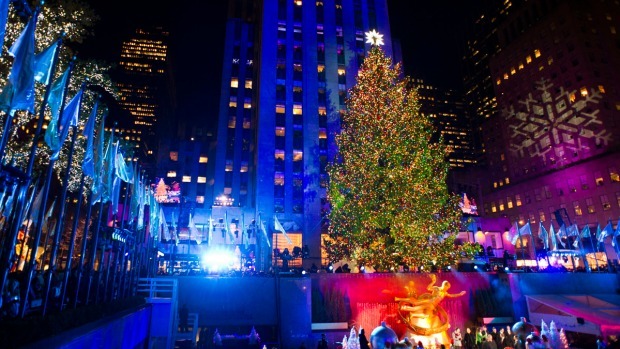 For the second time in six years, the city of Shelton, Conn. supplied the tree to Rockefeller Center for the annual holiday display. The tree, which made the 70-mile journey to its new home on the bed of a tractor-trailer, will remain on display until Jan. 7. First televised in 1951 on NBC, the tree lighting has grown to attract a quarter-million spectators and an audience of millions. 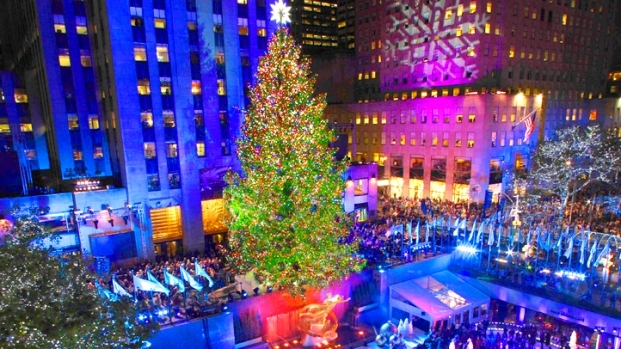 The annual event was inspired by construction workers who erected a tree of their own in 1931, decorating it with cranberries, paper garland and tin cans, according to Daniel Okrent's "Great Fortune: The Epic of Rockefeller Center."